What is Three Day Eventing? According to the United States Eventing Association (USEA) “Eventing could be termed an ‘equestrian triathlon’. It involves working with a horse both on the flat and over fences. 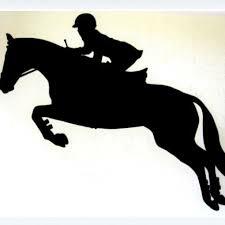 The three phases are: dressage, endurance (or cross-country), and show jumping. Over the centuries it has developed from the test of the ideal military charger. Eventing has now evolved into an exciting sport attracting interest from all levels of sports enthusiasts, from weekend hobby riders to professional international stars. The purpose of the dressage test is to demonstrate the level of communication between the horse and rider and to display the power and grace required to perform each movement with balance, rhythm, and suppleness. Due to the demands of the sport, the three-day event horse is extremely fit, and only strong and tactful riders possess the skills needed to harness and direct that energy into a both polished and powerful performance. ​The cross-country course covers approximately 2.75 to 4 miles, along which sit 24-36 fixed and solid obstacles. This phase is ridden at a gallop, with exact speed requirements depending on the level of competition. Cross-country courses require horses and riders to be bold and smart, while testing their physical stamina. The aim of each combination of horse and rider must complete, on time and with as few penalties as possible. Penalties can be accrued through jumping errors (horse refuses or runs out at an obstacle, rider falls off on course, etc.) or by exceeding the optimum time allowed. Of the three days of competition, the cross-country phase is usually the most appealing to spectators and riders alike. It is the ultimate challenge to prepare a horse for this rigorous test. Unlike other sports, where only the human will and body are pitted against the clock, in eventing, two minds and bodies work as one. As an additional attraction, eventing is the only high-risk Olympic sport where men and women compete as equals, with no separate divisions. ​The third and final test takes place in the show jumping arena. A show jumping course comprises a series of colored fences usually made up of lightweight rails that are easily knocked down. The test takes place in an enclosed ring and the course must be negotiated in order for the horse and rider to successfully complete the event. This final phase tests the stamina and recovery of the horse after the endurance phase and shows that it is fit enough to continue work. 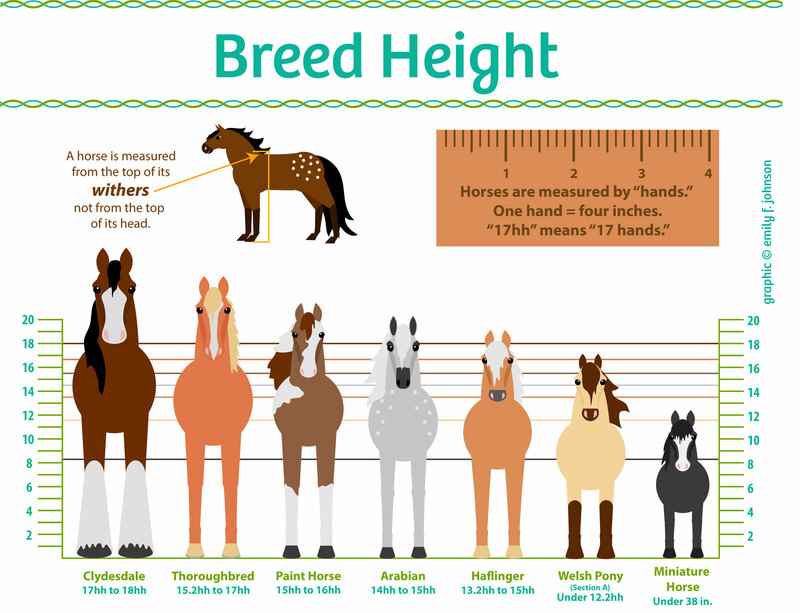 The average height of an eventing horse is typically 16 to 17+ hands high (a hand is 4”, the horse is measured from the ground to the top of the wither). Popular horse breeds for eventing are: Thoroughbred, Holsteiner, Warmbloods, Anglo-Arabian, Hanoverian, and Irish Sport Horse to name a few. In 2012, Elisa Wallace (an internationally recognized three day eventer) was the first Event rider to compete in the Mustang Makeover. Elisa and her Mustang, Fledge, won the 2012 South Carolina Extreme Mustang Makeover and Elisa gained national attention for her efforts with Fledge. At the end of the competition, all of the mustangs are auctioned off to Bureau of Land Management (BLM) approved bidders. Elisa’s bond with this little 13.3 hand, 3 year old gelding from the Maverick-Medicine Herd Management Area (HMA) in NV was too much to let him go to another so, she bought him. And so Elisa’s Mustang story began. Elisa’s Mustangs have changed her life. She is now an advocate for the Mustang in showcasing their versatility and ability and performs demonstrations with Fledge and Rune across the country. She continues to raise awareness about the 50,000 wild horses and burros in BLM holding facilities waiting to be adopted. That number is officially from the BLM as of April 2016 and it continues to grow. In 2013 Elisa competed in her second Mustang Makeover: the Mustang Million Legends at Fort Worth, TX. This time the Mustang she was training was Rune a 14.3 hand 3 year old gelding from the Piceance/East Douglas HMA in CO. Elisa couldn’t let Rune go either, so she adopted Rune at the end of the competition. In 2014 Elisa competed with Rune in the USEA Young Event Horse Series in the 4 Year Old Division and took Third Place. But, that is not the end of this amazing story…in 2015 Elisa Wallace entered yet another Mustang Makeover competition - Mustang Magic in Fort Worth, TX - January 2015. 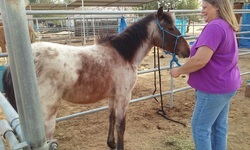 The horse she was awarded to train for this makeover was a gray, 6 year old, 14.2 hand mare from the Adobe Town HMA in WY. Elisa named her “Hwin”. Elisa and Hwin came in Fourth Place in the Mustang Magic, but won Fan Favorite at the competition. You guessed it….at the auction…Elisa bought Hwin. In the world of three day eventing where bigger has always seemed to be better…the taller the horse, the better the jumper, and the higher and wider the jumps that he can clear. It all seems so simple… like the formula for an engineering project. But, the one thing you cannot measure…. is HEART! 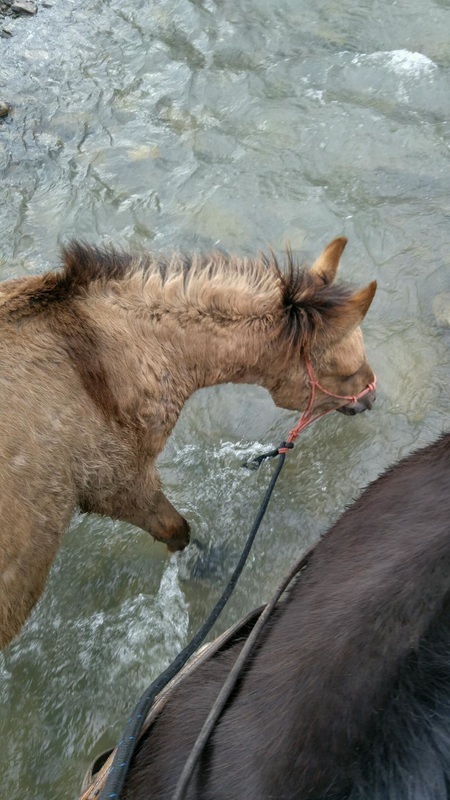 No one told Hwin, this little 14.2 hand Mustang from Adobe Town that she was too small to jump four foot fences. No one told her that she was too small to run several mile courses at a gallop flying over obstacles that she had never seen before. Hwin never realized how big or small she was. She loves to run, she loves to jump and she loves to think! Most of all, she has a partnership based on trust and understanding with Elisa. Elisa “knows” Hwin. She is in tune with her and what drives her and makes her motivated. Elisa is keenly aware of Hwin’s abilities, when she has mastered something, and when she is ready to achieve a higher goal. Elisa had vision to think outside the norm of what most believe an event horse should look like and saw inside this horse, where her heart is, and perceived what she loves to do. ​By March 2015, just two months after the Mustang Magic, Elisa started Hwin’s eventing career at the Novice level, completing four events at the level with three top-5 finishes. 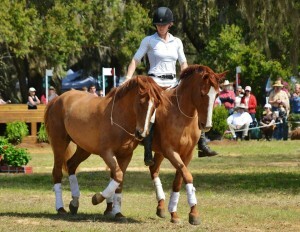 In November, they moved up to Training level at Ocala, FL, where they finished in seventh place. Since February 2016, Elisa has been competing with Hwin in the Preliminary Horse division of international eventing competitions. The next time you are thinking of what breed of horse to get for three day eventing, or even dressage and jumping for that matter, you might want to put MUSTANGS on the top of your list, and think of Hwin – the little Mustang that could! Emma Minteer working with Sweet Potato - desensitizing, building confidence and trust, and learning new obstacles. Sweet Potato also made a new friend at school. 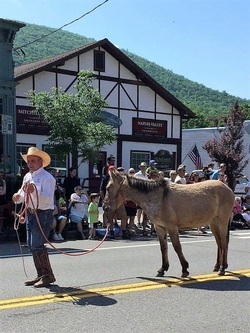 For our readers just joining in...Sweet Potato is a mule we rescued in December 2014. 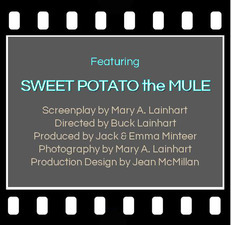 (Read Sweet Potato's story in our February Issue - The Beginning of a Journey). 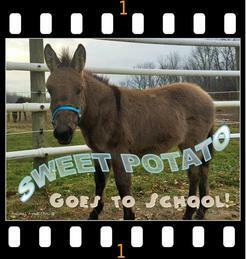 Last month in our May Issue was our first update on Sweet Potato going to school. In our April 2016 Issue we reported that we sent Sweet Potato, Neeheewanna, Wakan and Clover off to school to be trained by ﻿Jack and Emma Minteer ﻿at Rose Hill Ranch in Naples, NY. Clover and Wakan were only there for a month for a little "tune up" since we didn't get to ride at all last year. We wanted to make sure they were more conditioned before we started to trail ride this summer. Neehee and Sweets stayed an additional month. As we talked about in our last update in May, Sweet Potato was doing mostly groundwork and desensitization. 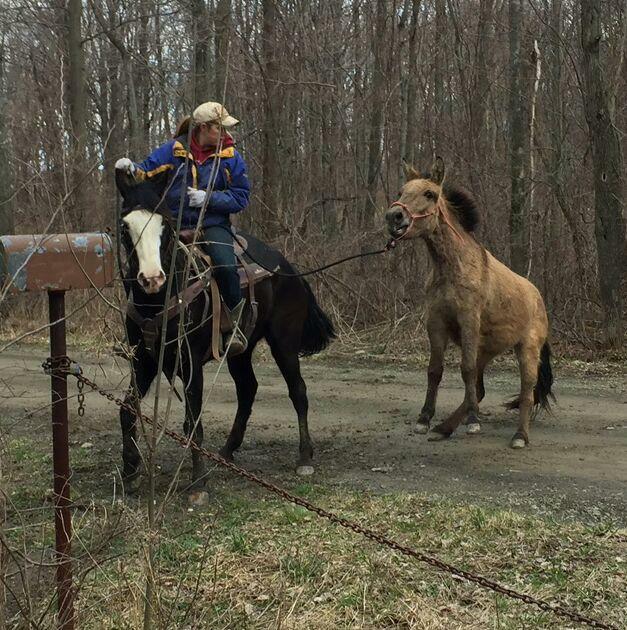 He has continued to learn how to lead and pony. Emma has been gradually teaching him how to lunge and he is beginning to get the hang of it. New obstacles were introduced to him and he accepted each challenge willingly. But school isn't all about work...it is about making new friends too. 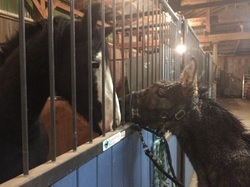 While Sweet Potato turned a few heads at Rose Hill Ranch and won a few hearts, he also made a new friend, Levi, Jack and Emma's little boy. School is out for the summer for Sweets. The lessons will continue at home as Emma teaches us to keep up the training she has taught him. He has a good solid start to doing ground work and learning. He has more growing to do, more lessons to learn, and a bright, happy future waiting for him at the Buck 'n' Mule Farm. I just wanted to share with you, my experience adopting my newest family addition. She is a 10 month old, bay roan filly that I adopted this March 2016. My daughter (Jennifer – May Issue) and I both adopted fillies at the adoption event that was held at the Double 6 Ranch in Apple Valley, CA. For the first couple days, I just sat with her and talked to her a lot, while eating a carrot. She was very frightened and choose not to approach me. I was sitting out on her salt lick one evening about 4 days later, happily munching on a carrot, ignoring her. I glanced out of the corner of my eye and she had inched her way up to being about 3 feet away from me, so I choose to hold the carrot out. She was wanting it, but still too frightened to get it from me so I broke off a couple pieces and tossed them to her. She ate those and all of a sudden decided I wasn't so bad. Next thing I know she ate the carrot, was sniffing me all over, and letting me touch her on the nose, forehead and neck. She kept looking at me eye to eye too. The next day I was able to work with her on being touched all over. So far I am able to touch and brush her all over, although she is NOT a fan of having her legs or cinch area touched yet she will let me rub her belly itself, (which she found she loves to have scratched.) She is also in the process of learning to lead, which she is getting the hang of quickly. She is a very smart girl and will let you know when something isn't to her liking. I think in this very short time I have had her we have made a lot of progress already. I know there is much more to go through with her though. I can’t wait to continue working with her and to take a look back a year from now to see how much has changed.